Just digging through the latest pile of QSL cards received via the bureau. One that caught my eye immediately was the confirmation of a 2 m QSO from England. 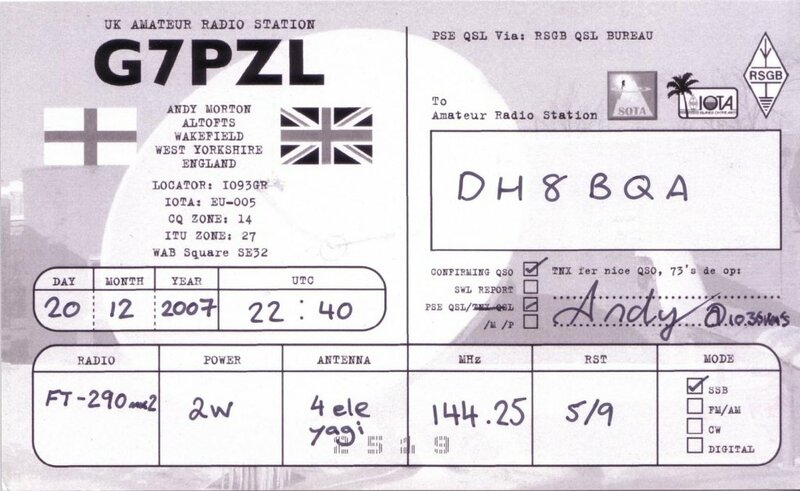 What makes it so special is that Andy, G7PZL, was running just 2 watts into a small 4 ele Yagi (certainly QRPpp on VHF) to work these 1.036 km. That is not going to happen very often. We had a strong tropospheric duct the week before Christmas 2007 and could work lots of DX back then for several days, was quite some fun. This is why I like paper cards! They make you remember all those special contacts you had, some pleasure an electronic confirmation will never be able to provide (although I like LotW and DCL, too, as they make awards chasing much much easier). This entry was posted in QSLs, Tropo, VHF. Bookmark the permalink.